← How deep does crowdsourced problem-solving go? 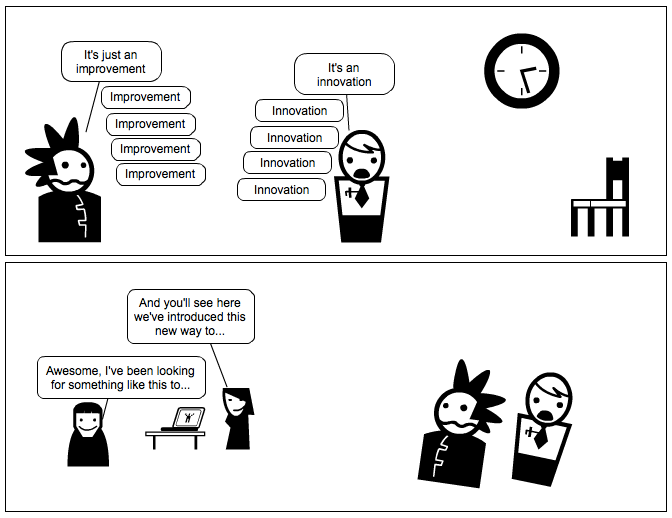 4 Responses to Is it innovation or just an improvement? Does it matter? Thanks for writing this. Part of the problem is the shortage of people willing to do some legwork and dig up what others have said about these issues. My fundamental point in my post was the people who do the real work, the inventors, the entrepreneurs, the risk takers, don’t care what it’s called. They just do it and care about the results. It’s the consultants, the journalists, and the authors, all prone to hype and confusing labels for the things being labeled, who obsess, debate and abuse these terms. It’s revealing to ask anyone who has these debates or uses these words: “What innovation have you made?” Often the answer is nothing, deflating whatever misplaced hubris they’ve been operating on in their arguments. I don’t think it matters. It’s confusing for most. I always tell companies, and people, that they should come up with their own definition. For me what matters is that it should have some intent, beyond just making it into Forbes list. For those of us who have done it, even though we didn’t set out to innovate, all that matters is making an impact; small of big. Any type of progress is important for innovators, and we also understand that there isn’t an “I’m there”, it is continuous and builds upon previous efforts. That’s why I see it more as a mindset, not a process that leads to an ending. Hutch, While working on my master’s thesis on creative leadership I researched numerous academic and practitioner definitions of innovation. I attempted to write the most succinct definition based on this research and came up with: “innovation is capturing value from an idea.” I like this because it can apply to anything and all innovation typologies. Like Scott and Jorge state, I don’t really think it matters in the end. That’s why I prefer a simple definition so everyone can move on to the really challenging work — figuring out how to take a promising idea and bring it to market.